For the past decade it has been one of the undisputed research success stories of the University: a relatively small team, successful in bidding for multi-million pound grants, leading some of the biggest collaborations in the field, and establishing itself among the most respected peers in the sector. Now with the creation of a new ‘robot home’ on campus, the work of the Centre for Robotics and Neural Systems (CRNS) is entering a new phase. Located on the first floor of the Portland Square Building, it is more than just an academic office with some IKEA furniture: it’s an interdisciplinary hub where an international team of researchers can study human interaction with the University’s ‘robot family’. A great example of this is a new EU Horizon 2020 project focused on supporting independent living through robotic companions. MoveCare: Multiple-actors Virtual Empathic Caregivers for the Elderly is being coordinated in Milan, with Plymouth leading a €440,000 strand on social interaction. 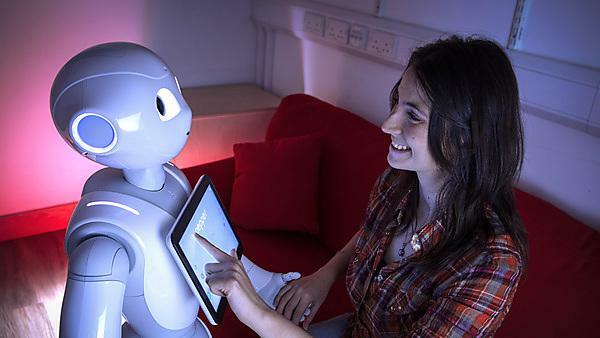 Working with Professor Ray Jones, in the School of Nursing and Midwifery, as co-investigator, Angelo welcomes elderly people from a care home in the city to the centre, where they interact with ‘Pepper’, the newest addition to the family, courtesy of Japanese company Softbank. MoveCare is one of nine current projects, representing an income to the University of around €4 million, and which have some 15 PhD students, and five postdoctoral researchers attached. Among that PhD population are seven funded by the Marie Curie scheme, each working on one of three projects: APRIL, SECURE and DCOMM, covering the topics of personal robotics, safe robot interaction, and communication using gestures, respectively. It is an indication of the importance being placed upon the subject of ‘collaborative intelligence’ – where humans and robots learn from one another to achieve a task. Robot learning has been at the heart of a number of Professor Tony Belpaeme’s projects over the past decade, and his latest, L2TOR is transplanting that principle to schools and language learning. The three-year Horizon 2020 initiative is focusing on teaching English to native speakers of Dutch, German and Turkish, but also teaching Dutch and German to children whose first language is Turkish. Using the Nao robots from the ALIZ-E project, children are invited to take part in a language game that involves learning numbers, spatial language and basic vocabulary through storytelling. Even in its early stages, L2TOR has found that the most cutting-edge speech recognition software cannot cope with the grammatical idiosyncrasies of children aged 4–6. It has also revealed a number of new avenues for enquiry, including the use of ‘deep learning’ to help the artificial intelligence overcome its inability to read emotion in faces. L2Tor is already generating huge interest in both the educational and robotics sectors, and entertainment giants Disney has even invited one of the project academics to work with its technologists in a bid to improve the experience of its theme parks. The presence of Disney – and the likes of Honda, and the US Airforce, with whom Angelo is working on a project called THRIVE, looking at the issue of trust with robots – is a very important one. At a time when Google has purchased the company DeepMind, commercial interest in robotics and AI is at an all-time high, which creates new avenues for funding. With Brexit on the horizon, the change of funding landscape will be especially challenging for robotics research, and will call upon every competitive advantage we can muster. And that’s why Robot Home is an important asset in CRNS’s continued evolution. “Plymouth is now among the main players in the field, and we make a major contribution to the Engineering and Physical Sciences Research Council Robotics and Autonomous Systems network,” adds Angelo. “The difference between us and the likes of Bristol, Edinburgh and Sheffield, is that they can draw upon multiple universities to create a bigger critical mass. But with our links to industry (for example, strategic partnership with Aldebaran-SoftBank Robotics), and our focus upon interdisciplinary projects, we are able to run innovative studies on social and learning robots, create and test more realistic scenarios, and this helps us with future grant applications, impact case studies, and commercialisation opportunities." The centre builds on world-leading excellence in computer science, robotics and neural systems research. Staff at the centre coordinate large projects and collaborate with major international centres in cognitive robotics and computational neuroscience.